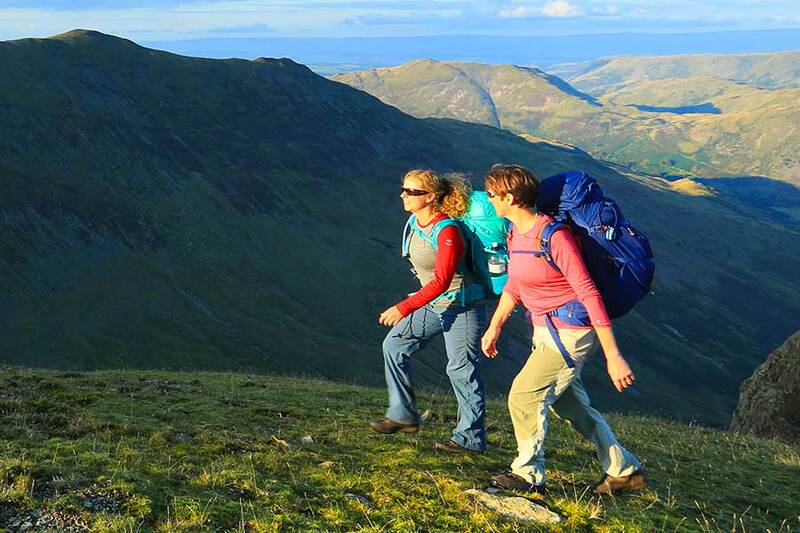 Whatever your budget there is a rucksack that is ideal for carrying camping equipment, spare clothes and food across the hills for days, weeks or even months at a time. Here’s our guide to the best 55-65 litre rucksacks for backpacking. The Trailhead has had a big makeover for 2019, so it’s virtually a new design and now resembles the Trailhead 50. The back system has also been changed and is now adjustable, via a series of webbing straps that move the shoulder harness. There is good stiffness in the back, and while not as comfortable as higher-priced packs it feels good. The body has lost the two side pockets of last year and now has compression straps and fabric rather than mesh wand pockets. The main lid is a fixed design, rather than floating, so it keeps water out of the main compartment more easily. There’s also external zipped base compartment access. All that for £115 and 1834g is impressive. The body is made from polyester rather than the tough nylon used on higher-priced packs, so this may not be the absolute best in terms of durability. Also if you pay more you get more comfort from the back system. The hipbelt is stiff and supportive, but it doesn’t rotate so there is just a little less freedom of movement here. Some may prefer a floating lid rather than the fixed design. The lid doesn’t get an underside pocket either. The side compression straps are not quick-release, and you don’t get a compression front panel. Lower-priced pack with a good weight, but if you can afford to pay more, then you can enjoy some of the benefits of higher-priced designs. Vaude’s Asymmetric packs have been around for a few years and regularly receive great reviews in Trail, thanks to their low weights and clutter-free designs. They also use more eco-friendly materials – this one has some recycled polyester and waterproof coatings free of fluorocarbons (PFCs). The back length is easily adjusted and the pack is comfy with lighter loads. The main compartment has front and base zipped access, a floating lid, and a massive zipped front pocket that’s good for jackets and overtrousers. 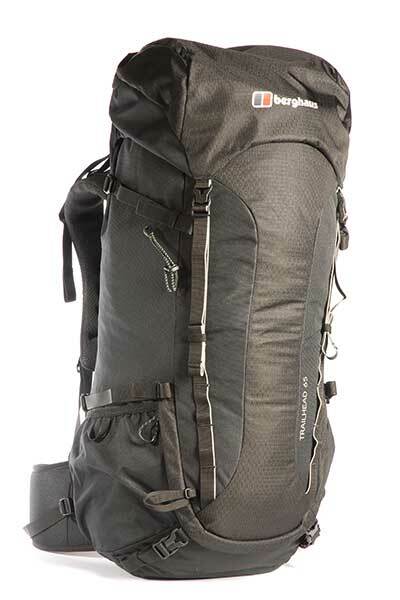 There are two good compression straps and mesh wand pockets on the sides, and the pack weighs just 1550g. It’s not as comfortable as higher-priced packs, and you need to keep the weight down to maintain that comfort. Also this pack has a slightly smaller capacity than others, with the women’s pack being quite small. The polyester is less hard-wearing than the nylon used in pricier packs. As with many, there is a floating lid, so care is needed to prevent leaks to the main compartment; but this one does sit slightly better on the top than some others. This pack doesn’t have a raincover, which is a drawback as the lid pocket zip doesn’t get an external stormflap either. With environmental benefits, less weight and a reasonable price tag this looks good, but it is a smaller capacity than others and not quite as comfy. a mesh covering over a layer of raised cushioned areas, so the overall effect is of padded contact areas and reasonable airflow. It’s a close-fitting back system too, with good support and stiffness to allow easy packing without objects poking into your back. The body has a main compartment with base zipped entry and a removable internal divider, as well as a zipped front entry. There’s also a conventional floating lid with a huge outside pocket and a useful mesh underside pocket. The front stretch compression pocket is ideal for a wet jacket between showers and you can stow trekking poles on the sides easily too. The weight of this pack is not the lightest but there are heavier packs. It is packed with features and some may feel they don’t need the two hipbelt pockets, or the front zipped access, or the floating lid – all of which add cost and weight. For me, a fixed lid would be preferable, but this is at least better designed than most. It is a well-built pack that feels durable, and while not the lowest price it competes well with others, although of course you could spend less if your budget is tight. A great backpack for shorter, less remote trips with features and comfort that will suit most users. This new pack for 2019 extends Lowe Alpine’s Manaslu range. The new VT-Plus back system is adjustable in length and operates by sliding the shoulder straps vertically along an alloy frame. The back system and hipbelt are very stiff, supportive and well-padded, making this better for heavier loads than lighter packs. The hipbelt also rotates to allow a little more freedom of movement. The body has one main compartment with base and front zipped access, as well as the floating lid at the top. The front stash pocket has side access and the top is stitched in place, which should prevent items bellowing out. The design is more durable than some lighter packs. This is heavier than others, due to its extra weight-bearing performance, although for regular longer trips I think it is worth it. The back system is very good, but some packs around this weight and price do allow even more airflow. Some details (the internal compression straps and ultra-robust materials) may be superfluous, so this may be more than casual users need. I prefer a fixed lid, although here it is less of an issue as the main compartment snow-lock extension is huge and robust, to prevent leaks under the lid more effectively than most. A supportive, robust workhorse that is ideal for heavier loads and longer trips, but the weight and price mean it may be more than some users need. This pack was released in 2018 and features a lighter design than some other Gregory packs, but you still get the supportive Aerospan back system and functional design the brand is known for. There are two fixed back length options, with a trampoline-style open mesh covering that holds the pack away from the wearer for more airflow. On the back this feels comfortable and fits well. There is one main compartment with just top entry via a floating lid. The lid has good pockets but to save weight it can be replaced by a simpler cover without pockets. The front and side stretch pockets are huge, making them ideal for stowing items needed regularly, and the weight is very attractive at just 1302g. There is no base or front access to the main compartment. Also while this pack copes well with smaller loads, it doesn’t perform as well as others with bigger loads, because the hipbelt is slightly softer. The floating lid niggles me, as I’d prefer a fixed lid. The side compression straps don’t get quick-release buckles either, so stowing trekking poles or other items on the sides is a bit more fiddly. Finally the price tag is slightly higher than others, even though you are getting fewer features. A lighter rucksack that is ideal for lighter loads, but you might miss some features and the price is relatively high for what you get.